There's no difference, unless you want an audio Bible or VCD, Mandarin and Cantonese are written the same but pronounced differently. Yes there is colloquial Cantonese, which is used in some of the tabloid press in Hong Kong and Guangzhou, but likewise speakers in the North of China also have things in their spoken language which would not normally be written. 2. Simplified script or Traditional script? The script used in China is a simplified version of traditional Chinese characters. Most Hong Kong, Taiwan and Malaysia Chinese can now read simplified script. In Singapore the government has promoted the change to simplified script. However most Bibles, and books published in Hong Kong and Taiwan are still in traditional script. This doesn't affect someone buying a printed book, but may affect someone attempting to read the Bible online or print out a booklet. There is a computer problem affecting all kinds of Chinese software - emails, webpages, Word documents, even Bible software. Pdf and txt files seem to be the safest formats. The coding used in Hong Kong (Big-5) and the rest of China (GB) are different. Usually web browsers will automatically detect if a web page is in Big-5 or GB. Microsoft Word complicates the problem further by having Microsoft's own system which may be unreadable in Big-5 or GB and turn a document into a lot of little squares. Emails sent between China and, say, New Zealand are often corrupted by the Big-5 GB problem or other problems. There is a handy website www.mandarintools.com which can unscramble emails, among other problems. Protestant Chinese Bibles come in two versions "Shen" and "Shang-ti", depending on whether the title "God" is printed 神 [shen] (God or god) or 上帝 [shangdi] (Heaven Emperor). A lot of Protestants don't like 神 [shen] because it can be used for the Christian God or for pagan gods, though of course the same is true of theos in the Greek New Testament. What usually happens is that Protestant Bibles are printed __神 [ shen], a space followed by Shen, and a note in the preface that __神 may be read "Shen" or "Shang-ti". The Catholic Bible has 上主 shangzhu in the Old Testament and 天主 tianzhu in the New. If the title doesn't say otherwise, a Bible will almost certainly be Protestant. This matters not just because the Catholic version includes the Apocrypha in among the OT books, but also because spelling of Bible books and names is different in Catholic and Protestant versions. Catholic versions use different spellings based on Latin pronunciations. For example, Mark is 马可 [make] in Protestant versions such as CUV, TCV, NCV, but is 玛尔谷 [ma’ergu] in the Catholic version. Names of books can also be different; for example, Psalms is 诗篇 [shipian] in Protestant versions, but 圣咏 [shengyong] in the Catholic version. 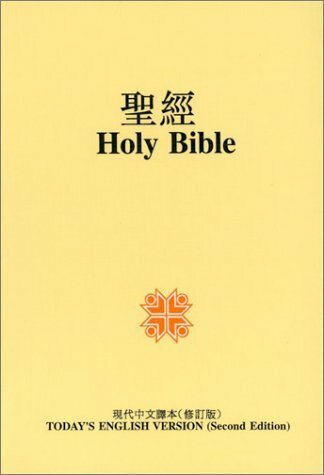 This distinction extends into the Apocrypha too, where the version in the Old Testament of the Muling Bible has the names of books spelled differently from the most widely available reference edition 圣经后典 [Shengjing houdian], Commercial Press, Beijing 2004. 6. Which Chinese Bible version? 1. Chinese Union Version (CUV) "Hehe-ben"
This is the standard version in China, and until 1997 was the only version. It is still very strongly preferred by Chinese Christians. On the plus side it exists in a variety of versions, and a cheap Chinese-English version (28.00 RMB, about 3.50 USD), has a fairly exhaustive concordance (15.00 RMB, 2.00 USD), is the version quoted in almost all commentaries, and is the version used for dubbing and subtitles in the Luke, Matthew, John and Acts films,. On the negative side the language is very antiquated, dating from the 1930s but displaying its origins in the Morrison Bible of the 1850s. Books such as Job and Psalms frequently throw up characters that are unrecognizable to even university educated Chinese. Even in the New Testament both grammar and vocabulary can be strange. Doctrinally it is no more or less prone to bias than the TCV, although it is often more literal. * CUV (和合本串珠版) chuan-zhu edition. The best noted edition of the CUV. Comprehensive introduction to each book, marginal references. Full concordance available. * CUV Study Bible - there are two versions, one licensed from Hong Kong one done in Nanjing. Both are very good on the Old Testament. Inevitably some of the notes have to be taken with a pinch of salt. * CUV-NRSV parallel text. (和合本汉英对照) Simplified characters and standard punctuation Footnote refs for New Testament quotes of Old but otherwise no marginal references. * CUV-NIV parallel text. Only available outside China, but now available in both simplified and traditional characters. Quotation footnotes to English text only. 2. Todays Chinese Version (TCV) "Xiandai-yiben"
The TCV, or Today's Chinese Version, is.a massive improvement on the CUV in terms of readability, and doesn't lose much in terms of literal accuracy. Doctrinally it is slightly less prone to bias than the CUV, but the difference is slight. The problem is that, although the TCV is now (since 1997) available through State churches in China the current edition has no footnotes or references - not even to NT quotes of OT verses. 3. New Chinese Version (NCV). NCV As modern as the TCV and as literal as the CUV, but not noticeably more accurate or less biased than either. The main problem with this version is that hardly anyone has heard of it and it is not available in China. * NCV-ESV bilingual version (新译本中英对照) Only available in Hong Kong and very expensive. Simplified characters. Book introductions but no refs. 4. Chinese Living Bible "Dangdai-shengjing"
Chinese Living Bible (当代圣经) published by International Bible Society of New York 1979. Paraphrase with few redeeming qualities. Available in both simplified and traditional characters. 5. Chinese Catholic Bible "Muling shengjing"
Similar to the CUV, or even older Chinese. Published in China but many Catholics use the Protestant CUV. The standard Chinese Catholic version is the 牧灵圣经 [muling shengjing], which is approved by the International Catholic Bible Society in Madrid, but published and printed by the China Christian Council in Nanjing. As noted above Catholic Bibles contain the Apocrypha among the Old Testament books, have different names for some books and some Bible people and places. This does apparently exist - a New Testament has been sighted on a doorstep in Auckland. Presumably it has all the problems of the English original. 7. Things to look out for in the Chinese Bible? The first thing to say is please don't attempt to teach from the KJV. If you do that you should know that you're simply being selfish, lazy and foolish. Selfish in putting your own comfort ahead of listeners, lazy in making the translator (or even worse if there is no translator!) do all the work to fill the gaps between your Bible and your listeners' Bibles, foolish in that the modern English versions are often nearer the Greek and Hebrew than the King James. The best English text is the one in the parallel text Chinese-English Bibles (whatever that happens to be). Sorry if that sounds strong, but it is the truth - selfish, lazy and foolish. If anyone is in any doubt on this point they should re-read Matt.5:41 and 18:2-6. 1. Jacob and James are the same in Chinese. This means if someone asks you a question about Jacob it may be about James. 2. Judah, Judas and Jude are also the same in Chinese. 3. The Chinese versions all have 耶和华 [Yehehua] for where the Hebrew text has YHWH, and where LXX, KJV, NIV have LORD. There is no distinction of Protestant-Catholic distinction between Jehovah and Yahweh as exists in English, Spanish, French, German Bibles, both Jehovah and Yahweh are Yehehua. Where the NT quotes "Lord of Sabaoth" Ro.9:29 Jas5:4 TCV has 万军的统帅 [wan jun de tongshuai] commander of armies. 1. Soul and spirit. Spirit 灵 [ling] and soul 魂 [hun] are hopelessly messed up in the Chinese Bible, even worse than in the English, and both can be translated as 灵魂 [linghun] spirit-soul. Soul is often translated life 生命 [shengming]. The "soul that sinneth will die" and so on are all gone in the Chinese. No more use to the teacher than the "dead soul" in Num.6:6. 2. Spirit and Holy Spirit are not distinguished, both are usually rendered 圣灵 [shengling] Holy Spirit. Often this is justifiable as the distinction between spirit and Holy Spirit is dubious in English; and Paul says there is "one" spirit, not two. However it does mean that the flesh vs. spirit battle from "the spirit is willing but the flesh is weak" onwards is lost. Spirit is sometimes rendered 心灵 [xinling] heart-spirit where the spirit vs. the flesh is meant, but sometimes 圣灵 [shengling] as in Romans 8. 1. The standard Trinitarian disputed verses, Rom.9:5, Titus 2:11, 2Pe.1:1, are generally all given a Trinitarian reading in all Chinese versions, without, unlike English versions, the courtesy of alternative readings in the footnotes. 2. Chinese has a confusion between the Word, logos 道 [dao] and the Way, path 道 [dao]. The word in the beginning in John 1:1, Luke 1:2 and 1 John 1:1 is dao, but John 3:34, 6:63 are 话 [hua] spoken word. The same ambiguity between word and way surrounds the Dao in Taoism. 3. John 8:58 "Before Abraham was, I was" - not "I am" as Greek and English. 4. Micah 5:2 "Whose origins are from the very beginning" 太初 [taichu] great-beginning, the word for beginning only used in Gen.1:1 and John 1:1. 5. Flesh and body. The Chinese versions are likely to change flesh 肉体 [routi] to physical body 肉身 [roushen] flesh-body, or body 身体 [shenti] in any context related to Christ. 6. Christ the man. The Chinese versions all delete or amend most of the verses where the Bible states that Christ is a man. 1 Tim 2:5 reads "one mediator, who descended to earth as a man, Christ Jesus". The inserted words "descended to earth as a" 降世为 [jiang shi wei] have three dots under each character to show they are inserted in the CUV, but not in TCV. 7. Temptations. As with English versions there is a tendency to change temptation 试探 [shitan] into test 考验 [kaoyan], in contexts relating to Christ. CUV does have 试探 shitan in Heb.2:18,4:15, in TCV it is 考验 kaoyan. 8. The good news is that none of the Chinese versions have the Johannine comma "the Father, the Word, the Spirit" 1John5:7. It seems the KJV, NKJV, Burmese and Fijian are the only Bibles that have this. Even modern editions of the Latin Vulgate delete it. 1. Care has to be taken to distinguish 天国 [tianguo] and 天堂 [tiantang], the former translates Kingdom of Heaven, ie from heaven not to heaven, the latter means heavenly court, where God resides. But in Chinese there is little difference. Heaven 天 [tian] and sky 天 [tian] are not distinguished. "Heavenly calling" Heb.3:1, "heavenly country" Heb.11:16 can be translated "to heaven" "in heaven". 2. Kingdom is generally translated country 国 [guo], with no emphasis on the king 王 [wang], although as you can see the pictogram for kingdom is in fact a king in a box, meaning a king and his frontier. 3. Luke 23:43 "I tell you, you will be with me in paradise today" (putting "today" 今日[jinri] at the end). The Gen.2:8 LXX paradise is translated garden as in English. The translation of the other 5 OT paradise verses follows English. 4. Hell. The Chinese versions are better than English in having separate words for Gehenna 地狱 [diyu] and Hades 阴间 [yinjian]. The problem is that 地狱 [diyu] does not suggest the Is.66:24 judgment fire but literally means "underground prison". Yinjian 阴间 is the abode of conscious dead souls in Buddhism. 5. Devil. The Chinese characters for the Devil 魔鬼 [mogui] magic-demon, make a very powerful visual impact - the second character actually is a pictogram of a beast with scurrying legs. The character for demon 鬼 [gui] is the usual character for ghost in Chinese religion. The Chinese versions generally always give a supernatural, demonic, reading to a verse if one is possible: devils 鬼魔 [guimo] in Lev.17:7, De.32:17, 2Ch.11:15, Ps.106:37, Azazel in Lev.16, an evil demon 恶魔 [emo] in Judges 9:22, 1Sam.16:14,15, 18:10, 19:9, Lilith in Is.34:14. Satan 撒但 [sadan] only appears in 1Chr.21;1, Job, Zech 3 and the NT. The term "sons of God" in Job 1:6 is 神子 [shenzi] god-sons in TCV, similar in CUV. "Fire of God" in Job 1:16 is translated literally in CUV, rendered lightning leidian in TCV. 1. The CUV separates Pentecost tongues, 乡谈 [xiangtan] dialects, from tongues in Caesarea Ephesus and Corinth 方言 [fangyan]. Actually the second term fangyan means rural dialect, but Chinese Pentecostals therefore see the tongues in Corinth as different from Acts 2, not needing to be understood. 2. The little word "of"的 [de]. The Bible distinguishes the Holy Spirit 圣灵 [shengling] given in John 20:22, from the Gifts of 恩赐 [enci] which were given 47 days later. The only "gift" attached to the former was forgiveness, which is not a miracle. Constant emphasis needs to be made that there is a big difference between the spirit [shengling] which have today according to Paul, and gifts *of* the spirit 圣灵的恩赐 [shengling *de* enci] which have ceased. Because the Chinese Bible so often adds Holy [sheng-] to Spirit [-ling], the Chinese Bible forces Christadelphians to get out of a bad, and scripturally unjustifiable, habit of talking about God's Spirit, the Spirit, Holy Spirit as if these were different things. They aren't, as a few hours with a concordance will show. Rather than making distinctions about "spirit small s" "Spirit capital S" or "a holy spirit" "THE Holy Spirit", which don't stand up in Greek or English it is best to stick to reading what the text says. "Gifts of" as "gifts of", "power of" as "power of". Pentecostals, and some Christadelphians, have a bad habit of confusing "of" with "is. So "Power of the Spirit" is read as "the Spirit IS power", which it isn't, power is power, spirit is spirit. Compare John 20:22 (paralleling Gen.2:7) or John 3:8 (quoting Ecc.11:5) where spirit means breath. Fortunately Chinese students are often better at understanding the meaning of the little word "of" 的 [de] than their Christadelphian teachers so will be less resistant to learning this than their teachers are to teaching it. 3. This isn't a translation problem but note, care has to be taken with circumcision 割礼 [geli] and castration 阉割 [yange], as some people don't know the difference.